Many people add pumpkin to their meals without knowing its immense health benefits. Pumpkin pie, pumpkin bread, pumpkin smoothies, baked pumpkin, pumpkin ravioli, pumpkin soup, pumpkin risotto… there are so many wonderful and delicious pumpkin recipes and even more healthy reasons to have it for your dinner today. Numerous studies show that consuming pumpkin regularly can help keep your heart and eyes healthy and can even help you drop weight. Here are a few more reasons to include pumpkin in your eating plan. Just like sweet potatoes, butternut squash and carrots, pumpkin is high in beta-carotene, a powerful antioxidant that can help lower the risk of cancer, including prostate, breast cancer and lung cancer. I think it’s a good reason to munch on some pumpkin today. Pumpkin soup or pumpkin pie? What’s your choice today? I love to add a little bit of pumpkin to my smoothie instead of banana. It tastes amazing and I know that I reap some health benefits from it. If you feel down today, consider snacking on some pumpkin seeds and see the results. The thing is, pumpkin seeds are an excellent source of the amino acid tryptophan, which is crucial in serotonin production. Eating ½ cup of pumpkin seeds each day can help you reduce stress and anxiety, and fight depression. Just half a cup of these little seeds contains almost your whole recommended daily amount of magnesium, which is great for your mood. If you don’t want to eat pumpkin seeds plain, add them to your salad, smoothie, oatmeal or trail mix. Stop spending lots of money on those expensive creams that promise to eliminate your wrinkles. They won’t help! Consuming the right foods daily will help you combat acne and wrinkles, keep cancer cells at bay and keep your skin healthy. Pumpkin is one of the best foods for your skin. It’s packed with vitamin A, vitamin C and vitamin E, which are all help fight wrinkles. Are you sure you don’t like pumpkins? As I mentioned above, pumpkin (especially pumpkin seeds!) is good for your heart. It helps reduce your levels of LDL or “bad cholesterol.” And the healthy cholesterol levels mean a healthy and happy heart. Pumpkin seeds are also rich in magnesium, an essential mineral, of which many people have a deficiency these days. Magnesium helps normalize the blood pressure and reduce the risk of stroke and heart attack. According to the National Institutes of Health, a cup of cooked and mashed pumpkin has over 200 percent of your recommended daily amount of vitamin A, which helps keep your vision sharp, especially in dim light. Moreover, pumpkin is a great source of carotenoids, and it provides your eyes with powerful antioxidants lutein and zeaxanthin. Enjoy your favorite pumpkin smoothie today to keep your eyes healthy! Pumpkin is a fantastic weight loss food. A cup of pumpkin contains 3 grams of fiber and only 49 calories. Pumpkin keeps you feeling fuller for longer by slowing down overall digestion, and you don’t have to worry about calories. 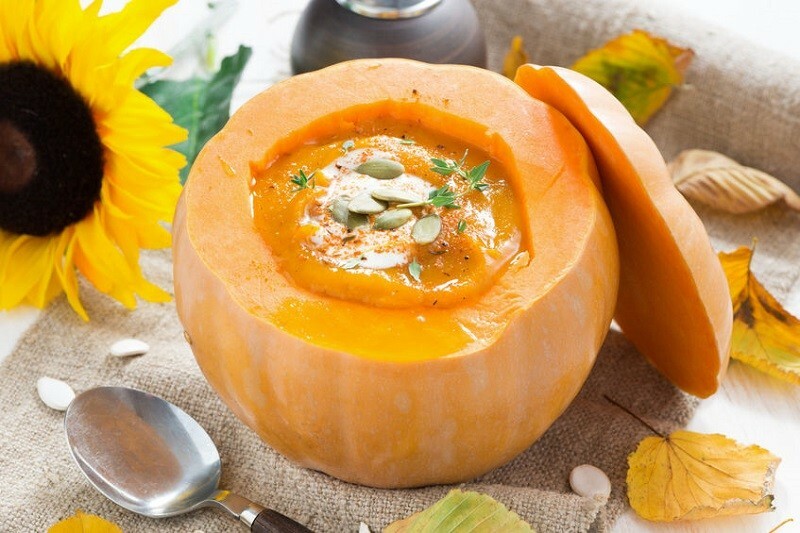 A healthy pumpkin soup or pumpkin risotto makes a perfect dinner for dieters since it can keep you full until morning! The season of cold and flu is here, so it’s important to boost your immune system. Pumpkin is plentiful in zinc and vitamin C, which are essential for your immune system health. A cup of cooked pumpkin contains over 11 milligrams of vitamin C, so why not make pumpkin the star of your meal this winter season? You can make your own pumpkin ravioli, or pumpkin oatmeal, or simply roast your own pumpkin seeds. One of the best things about pumpkins is that they are incredibly versatile and budget-friendly. You can add pumpkin to your morning smoothie or omelet, snack on pumpkin seeds, and have pumpkin soup or ravioli for dinner. Pumpkin pie and pumpkin cookies are sweet treats your family will love too. Are you a big fan of pumpkin? What are your favorite pumpkin recipes?